Is possible to configure a Linux computer to work as a "network printer device" ? I have an USB printer that I intend to share in the network like a native network printer device. NOTES: 'Autonomous' network printers usually communicate with the protocol "HP Jetdirect" (Also known as "Raw"). I have a RS/6000 with AIX 5 that finds and works with any kind of 'autonomous' network printer. And I would like to expose through Linux (preferably Debian) an USB printer in the network, like any ordinary network printer (autonomous device) which I could access in AIX. $ Hello remote USB printer plugged in a Linux ! I understand that network printers use a protocol called RAW (or Jetdirect), is that correct? Yes. There are two network protocols for print jobs that are still relevant today: LPD, running on TCP port 515, and JetDirect, running on TCP port 9100. LPD was designed by Berkeley for BSD UNIX in the old days. It's pretty much obsolete now, but it's still available on many printers, presumably for compatibility with old servers. JetDirect was designed by HP in the early 1990's, and it's simpler and somewhat faster than LPD. You should probably use JetDirect whenever available. I have a RS/6000 with AIX 5 that finds and works with any kind of 'native' network printer. And I would like to expose in the network a USB printer like a network printer (autonomous device), using Linux (preferably Debian) to do that. Install CUPS on a Linux machine, and connect the printer to it. You don't even need a full machine for that, a Raspberry Pi or similar, or a home router with an USB port and running OpenWRT or DD-WRT, would work just fine. CUPS allows you to share printer with (at least) IPP, LPD and samba protocols out of the box. IPP is supported by most operation systems and IBM was part of the Printing Working Group which came up with IPP so it's likely supported in AIX as well. But none of the documents I came across referenced AIX version so I can't be sure if AIX 5 is supported or not. The way it works anyhow is that you plug the printer to server with CUPS installed and select the method of sharing, broadcast settings etc. It's straightforward. Then clients can connect to it and it'll show up as network printer. These "network printers devices", could implement some protocols, being one of them the one called "HP JetDirect", also known as "Raw", "JetDirect", either just "9100". It seems to be the most common protocol supported by network printers. The JetDirect protocol is just an ordinary network stream, and not a real protocol, at least in my tests. So, you don't need CUPS neither any kind of printer engine to have a Linux behaving like a network printer, all you need is a 'network stream server' like inetd (or xinetd), to listen to the port 9100 and redirect this stream to the printer stream. $ Hello remote Parallel printer plugged in a Linux ! Of course, there are concurrency issues which beyond others solutions could be handled by CUPS configuring the local printer under a spooler. It worked for me ! You'll probably want to install CUPS; according to this page it's definitely available for AIX as well. Once you've configured it to recognize and use your printer, you probably want to check here for instructions on how to share it across the network. Alternately, you can use samba to share the printer; nowadays most OSes speak the protocol. Export a printer by simulating an HP JetDirect interface. to the device input and vice versa. The USB printer would appear as a character device /dev file on the linux server and then get exported to the network IP address port 9100 by lp_server where the AIX computer can find the simulated Jet Direct print service. This should be very similar to the minimalist inetd answer and just provide another choice. Not the answer you're looking for? Browse other questions tagged networking aix cups printer or ask your own question. 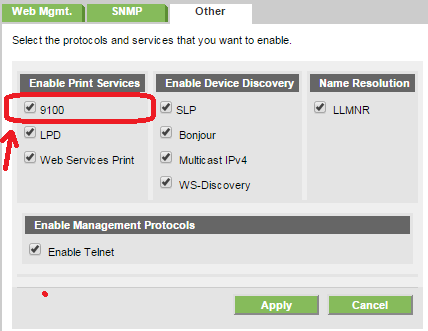 How do I install a network printer without being dependent on the IP-address of the printer? How do I share a CUPS printer easily in Linux?